Next week I am having the naughty polyps in my uterus taken out. This morning I went to the gynae to do all the pre-admission stuff. Don't know whether I am si-fatt-hun (itchy bum) or not, but I asked him to do an additional procedure. As I will be under anaesthesia for the polyps why not check my fallopian tubes too? Other news, my Pap smear result was negative. But I have candida, great, a colony of yeast having a party down there. I didn't have any symptoms before, but as soon as I heard the news I started to feel a twitch itchy. Ei-yar! Just another fraught visit to the gynae. Good thing his practice is behind Paragon. On the second level is Blood Cafe, right inside the oddly named boutique Project Shop Blood Bros, where their cakes are lovely and their chairs comfy. 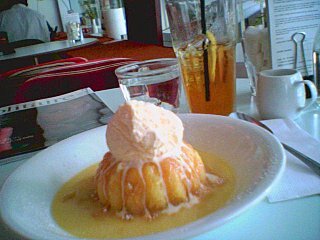 The beautiful lemon pudding was most soothing and lemony, it did much to restore the equilibrium. A spot of shopping after didn't hurt either. Why cook when others do it way better? I look at all those food blogs out there and I feel a little inadequate. It is not that I think my blog is lousy so I am not asking for compliment ah, but there are soo many food blogs out there with better writing, better photography and strikingly, lots of people cooking up a storm all over the world, 24/7. Well, not me. My pots are getting rusty, my cookbooks are already thickened with neglect and dust. Does it matter? Maybe not, as sometimes having friends who cook well can compensates for my kitchen failings. Like the pot-luck dinner in our friends' house last month. As it was a working day I could use the excuse for not cooking anything and instead ordered some ang koo kuey from the shop-that-never-seems-to-open in Thomson Rd. J&M are generous hosts. Although it was a pot-luck event, they laid out enough food to feed all even if everyone came empty-handed. First, the host opened a huge bottle of Proscecco. Lovely, every dinner party should start with a glass of bubbly Proscecco. See how many glasses I can drink before I stumble on the pronunciation. We brought two types of ang-koo kuey. A sweet type, and a savoury type. The savoury type (see yellow sticky cake in the picture on left, in front of the stack of paper napkins) filled with a minced chicken- mung bean paste with a sweet peppery taste that went down well with the girls and made the men pull an awkward face. The sweet ones were filled with classic bean paste, for dessert. Then the long table was filled with loads of delicious home-cooked dishes. Two, maybe three types of curries. Three types of rice. Finger-licking baked chicken wings. Ribs. Salads. Duck. And Andrew's Chinese banquet-style smoked oysters wrapped with seaweed served alongside meaty fresh shitake mushrooms that soaked up the multi-layered braising sauce of beef and seafood juices. I was guilty of misappropriating the bulk of the mushrooms. Desserts were a serious affair. Rich cheesecake. A classic orange pound cake by master cake maker J himself. A gorgeous lemon cake drizzled with loads of zesty icing, made by M of M&F, another talented baker who also makes wonderful Nutella cake. Ang koo kuey. A bounty of fruits. And loads of wine too. Red, white, and some shades in between too. Cheers! In a story about teahouses in one of the city's weekly guides, the reporter who went to Qiuping teahouse (500 Xiang yang Lu) remarked on the owner's dog which appeared in two different outfits during her visit. How intriguing I thought, so I took the ladies to tea after one of our shopping expeditions in the hope of meeting the fashionable pooch. But I picked a lousy day, the owner and dog were not around. Next time I'll call ahead: no dog, no visit. Well, unless we were in the neighbourhood and felt a little hungry. The little snacks served with the teas were not especially filling but would be ideal as mid-shopping refreshments. Sets of tea (green tea or young pu-erh) with a choice of three tea snacks was available for RMB48 (SGD 9.60) per person. The waitress helped us to select nine varieties from the extensive list on the menu -pig' tongue aspic in oolong, braised beef cubes with red tea, marinated young bitter gourd with jasmine, longjing shrimps etc. All the tea dishes were light and the tea flavours came out beautifully in each creation. The teas were not of very high quality though premium selections are available at higher prices. A travel magazine recommended that the Wuzhen water village was worth visiting because the place is well preserved and less commercialised than places like Tongli and Zhouzhuang. So I hired a driver to take us there (2.5 hours each way) and we spent a day out of the city. On the expressway to Hangzhou/ Wuzhen/ Suzhou, we stopped for a toilet break and came across a shop that sells zhong ji (rice dumplings). Many varieties on offer, freshly cooked, cheap and delicious. Their staff would unwrap the dumplings and pack them in individual plastic bags to save us the trouble of faffing around with greasy lotus leaf wrappers. Our driver said that there are other similar shops around the area but this brand is the most popular. Wuzhen is quietly charming,rustic and pretty laid back for a tourist attraction, i.e. souvenir shop workers are not outnumbered by resident villagers. Unlike Zhouzhuang, this is a working village and most of its inhabitants have not been chased out by the developers. We could peek into the houses and see people playing mahjong, watching TV or feeding their chubby babies. Some cottage industries exists, like turning peasant fabrics into clothes and household items. And also a working distillery which was giving out samples of their rice wines. The big round wooden cask in the centre is where the fermented rice is cooked with water over a 'stove' built into the ground. The vapours collect over the pipe above and drip into the big barrel on the left. The wine is then collected and stored in large ceramic jars. This particular brand was very rough and not very drinkable; maybe it would be good as a cooking ingredient. People ask me which is the better "water village" to visit: Zhouzhuang or Wuchen? Both places occupy opposing ends of the conservation spectrum. I prefer Zhouzhuang even though the latter is much derided for being overdeveloped. The thing is, Wuzhen may be intact and original, but it ain't exactly pretty. My senses gravitate more towards meandering canals, weeping willows, graceful arching bridges and well-proportioned courtyard mansions, and I am not particularly keen on scrubby backyards and muddy channels. Just call me shallow, but Zhouzhuang is still enduringly popular because its inherent beauty allows one to overlook the touts and the tacky souvenir shops that mars its landscapes. It is not easy to strike the perfect balance between preservation and development, and interestingly, both villages are earmarked as heritage sites. Go and see for yourselves.